Things aren’t going to get any easier for the staff at Chastain Park Memorial Hospital. FOX has renewed The Resident TV show for a third season. The series currently airs on Monday nights. 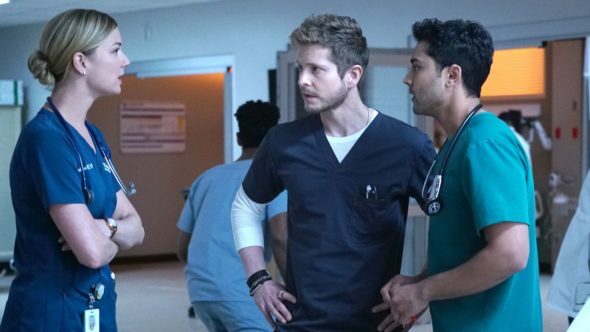 A medical drama, The Resident stars Matt Czuchry, Emily VanCamp, Manish Dayal, Shaunette Renée Wilson, Malcolm-Jamal Warner, Jane Leeves, Glenn Morshower, and Bruce Greenwood. The series centers on resident Dr. Devon Pravesh (Dayal), as well as Senior Resident Dr. Conrad Hawkins (Czuchry), and their colleagues at the Chastain Park Memorial Hospital. Although its motto is, “Committed to excellence,” the hospital is staffed with human beings, and humans are flawed. Now that Devon is on the other side of the institution’s velvet ropes, Conrad wants him to understand the reality of medicine and its delivery. The second season of The Resident on FOX is averaging a 0.97 rating in the 18-49 demographic and 5.04 million viewers. Compared to season one, that’s down by 4% in the demo and up by 11% in viewership. Compared to the rest of FOX’s scripted series, The Resident is a middle-of-the-road performer in the demo but is number three in viewership. What do you think? Do you like The Resident TV show? Will you be watching season three on FOX next season? The Resident: Cancelled or Renewed for Season Three on FOX? The Resident is a fantastic show and I’m very excited and grateful that it will be coming back for a third season! I will definitely be watching! I love the resident and i will definitally watch season 3! When will season 3 start? Love this medical drama! Much more realistic than other medical shows, they must have a great team of doctors behind the scenes. Scenarios are more true to this medical world we live in and although sometimes negative, it’s the reality of healthcare. Excellent acting! Now let’s spice up the romance for season 3!